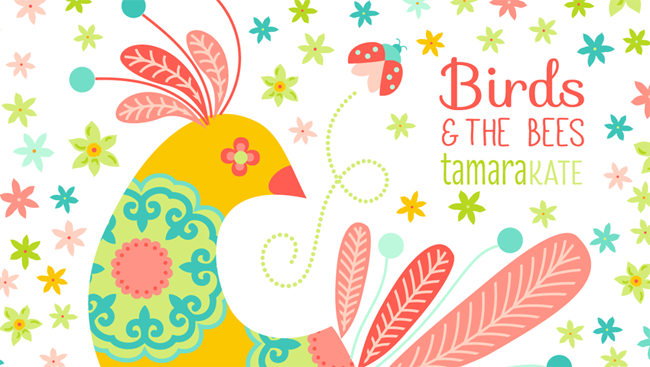 making it fun: Tamara Kate – Birds & the Bees & a Giveaway! I am thrilled to be with you today on the Michael Miller blog to give you a glimpse into the inspiration for and the thought process behind the creation of my latest fabric collection, Birds & the Bees. I also have a few project inspiration images, including free quilt patterns and finally, a FABRIC GIVEAWAY! As a fabric designer, I am often asked where I get the inspiration for my work. 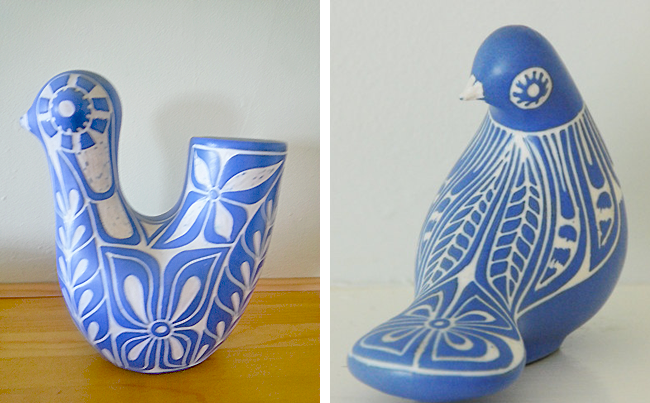 Honestly, it can come from a wide variety of places… my children’s musings, a nature walk, my Mom’s garden… but in this case, I started with my recollection of a large ceramic bird that my Mom had when I was growing up, by Chilean artist Pablo Zabal. Examples of PabloZabal’s work. The one on the left is my Mom’s. I did not want to create a literal rendering of it, but rather be influenced by my memory of the feeling and whimsy of it. So, after much playing with pattern, form and color, adding some playful feathers, strewn flowers and the occasional fancy-flying ladybugs, this, Feathered Flock is what emerged. Seeing that insects were creeping into the work again as they so often do with me, I then made the decision to just go for it and make the collection be all about flying creatures. This print, All the Wee Beasts came next. Take a closer look at the smallest insects in the above image, those little bees. Their abdomen reminded me of a beehive. Honey Honey thus emerged as a geometric blender print, as did Eye Candy, which started as a stripped down, modern flower center. I was thinking about an insect’s attraction to the bright colors, hence the print’s name (along with its similarity to Life Saver candy). Love Bug simply evolved from looking at the ladybugs in Feathered Flock a little differently, seeing the similarity in their shape to that of a heart. I was remembering growing up in the Caribbean, having winged creatures flittering around at night, so Baby the Stars Shine Bright was born more from memories of tropical nights (without the invasion of big city lights) than anything else. Sometimes patterns are created more from a need for something to balance a collection. After all those smaller scale prints, Blossoming was all about a large-scale modern flower. And the need for something more linear came in Loop-di-Loop (my take on insects’ flight paths) and Toutes les Plumes, which, while it was the final print created for the collection, also ended up being one of my favorites. A few other color versions of certain designs were added to balance the group, called Ladybug. Once the prints all worked together as a whole, it was time to play with an alternate color scheme. I started playing with magentas and indigo and the Bluejay color story emerged. Achieving the colors that are finally printed on the fabric is a fine balance and a team effort, for sure. I hand my work over to the talented Karen Jarrar at Michael Miller who, in turn, interprets that for the mill. She and I work closely together, both giving input to try and end up with a cohesive collection that works for you, the sewer. Whether you are making clothing, a quilt or some other project, I hope you are inspired by the result of what we have created. To celebrate the release of Birds & the Bees, Michael Miller is generously offering two fabric bundles, one in the Ladybug group and one in Bluejay, to two lucky winners. 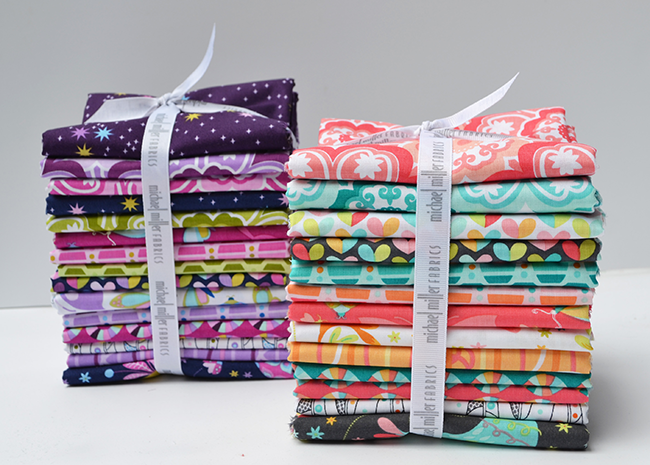 These are half-yard bundles, so lots of fabric for you to sew all kinds of amazing creations. To enter, let us know below which fabric group you would prefer to win and what you would sew with it. We will randomly choose a winner for each. "My husband's niece loves purple, so if I'm lucky enough to win, I'd choose the Bluejay color group & make her a quilt. Thanks." I love those ladybug prints! I would use them to make a gift for my best friend's twin baby girls who are scheduled to arrive in October! Both are great, but I'd pick ladybug and use it to make clothes for some softies I'm sewing as gifts. Oh here's to actually posting a whole comment and not just half. Ladybug is just beautiful. I'd make a lap quilt for my daughter. I am drawn to the cool colors, and would love the chance to work with the Bluejay colorway to make some clothes or wall hanging quilts. I love working with Origami Oasis, so this looks amazing! Bluejay! I'm such a sucker for purple. I would definitely make a dress for my daughter! Bluejay has great colors in it and would make a nice dress for a niece. Love Ladybug also but love the purples in Blue Jay. I really like the Medallion quilt pattern too. Either one would make a beautiful project. I would like to recreate the flight formation quilt in Ladybug! 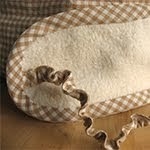 I can also see many of the fabrics in kitchen accessories such as placemats and napkins. So pretty! I like them both! 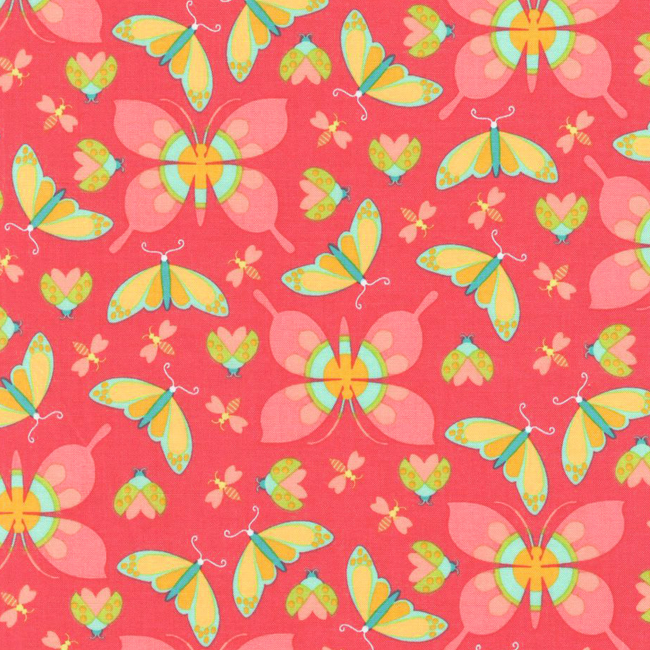 but I think Ladybug would be my choice to make a summery lap quilt! Love your designs. I still have some Origami Oasis hidden away! And thank you for sharing your design/creative process!! All these fabrics are so beautiful - I can never resist Tamara's beautiful fabrics. If forced to choose I pick the blue jay color way . I would make a quilt for my granddaughter. I love both colorways, but I would start with Blue Jay. I would make a quilt for a friend who loves purple. Thank you for sharing your design process and for the giveaway. Love the Bluejay colors....so will the granddaughters! This is a wonderful collection and I enjoyed hearing how the prints came into being. I would choose Jaybird and make a quilt. Both are beautiful, but if I had to pick I would pick Ladybug. I would use them to make a quilt for my daughter that she has been wanting and even some of the teal fabrics can be used on my son's quilt. Oh my goodness!! 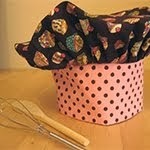 I spotted your fabric line a few days ago and quickly added it to the top of my Fabric Wish List!! I especially love the Jaybird colour way - it is absolutely fabulous!! I would make a quilt for our master bedroom... Unless, my daughter falls in love with it😉. The LadyBug bundle is singing my song! I would make a lovely summery table runner and some matching quilted place mats with this fabric! Both bundles are beautiful! Both colour ways are lovely, but I love bluejay best of all. I'm a cool colours girl! HELLO,these are such Beautiful Bundles! I do favor the "BlueJay", but they are both gorgeous! I can see a very neat quilt out of these! Thank You so much for a sweet and generous giveaway! HAPPY SUMMER ! Both are so beautiful, it's difficult to choose! Since purple is my favorite color, I have to go with Bluejay. I would love to use it to make matching skirts for my niece, Ella, and her doll. They are both lovely but if I HAD to choose, Bluejay is my favourite. I'd love to make the gorgeous heart quilt and put it up in my house to admire every day. Oh how the Feathered Flock reminds me of my grandmothers collection of Zabal pottery birds. The ladybug collection would make adorable weekend getaway bags and accompanying toiletry bags. I would most like the Jaybird color way. Thanks for the chance to win! Oh this is so difficult to choose as your line is wonderful. If I must choose one, then Bluejays. Thank You for sponsoring this exciting give away. I love both! If I was forced to pick I would go with Bluejay since purple is my eldest's favorite color and green is my youngest's. Loveeeeee these so much! They are beautiful together but if I don't win I'll definitely be purchasing the Bluejay bundle unless I can convince my husband to let me buy both! :) I'll be making a quilt! Both colorways are gorgeous I would choose bluejay and make a quilt for a friend who loves purple. I think that this new fabric line is gorgeous! I love the birds and bugs and all the bright colors! I love color! Both lines are great but I think I really would like the Ladybug line. Thanks! Oh my, I love both but I would have to say Bluejay would be the one I'd love the most as I just adore those gorgeous purples and pinks and so would my daughter. 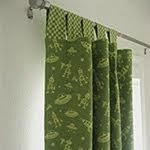 This fabric line is definitely on my wish list, at the top of the list. I'd be one happy sewer if I won the bundle. Thank you. 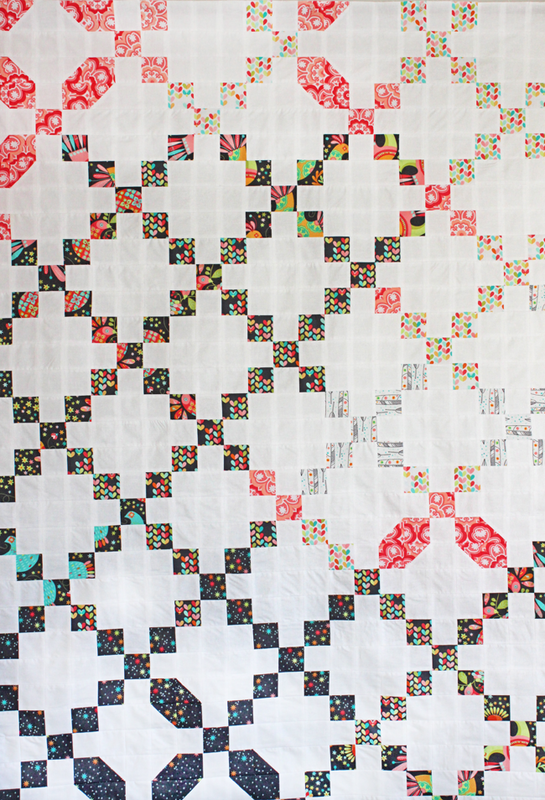 I also love that you shared your process of designing and that dress and quilt are amazing!!! I forgot to say what I would make with the Bluejay fabric. I'd make children's clothing from it. Thanks. My husband's niece loves purple, so if I'm lucky enough to win, I'd choose the Bluejay color group & make her a quilt. Thanks. Both colorways are wonderful and normally I'd be drawn to Ladybug because those are some of my favorite colors but this time I would choose Bluejay. There is just something about the purple and green combination that keeps me going back to them. 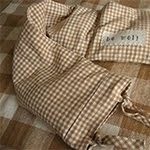 I would make a bag with two of the fabrics and use the rest in a lap quilt. I'm hard pressed to choose one over the other as they are both gorguss!! I'll go with Lady bug which I would use to make various items for my three grand girls. What a great giveaway. Both are great, but I would have to go with the bright colors of BlueJay!!! There is so much I could make with this, but I would probably make a quilt. It is such a gorgeous fabric line and several quilt patterns come to mind that would highlight this. I would love the Ladybug group because that is what my mom called me growing up. I was her "ladybug" or "bug for short. I would be selfish and make a quilt for me from it! What delightful fabric! 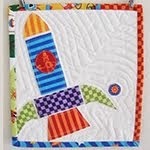 I love the look of the Flight Formation quilt, and I would definitely use this fabric for that. I like both colorways, and Bluejay is my favorite. Thanks for sharing this! 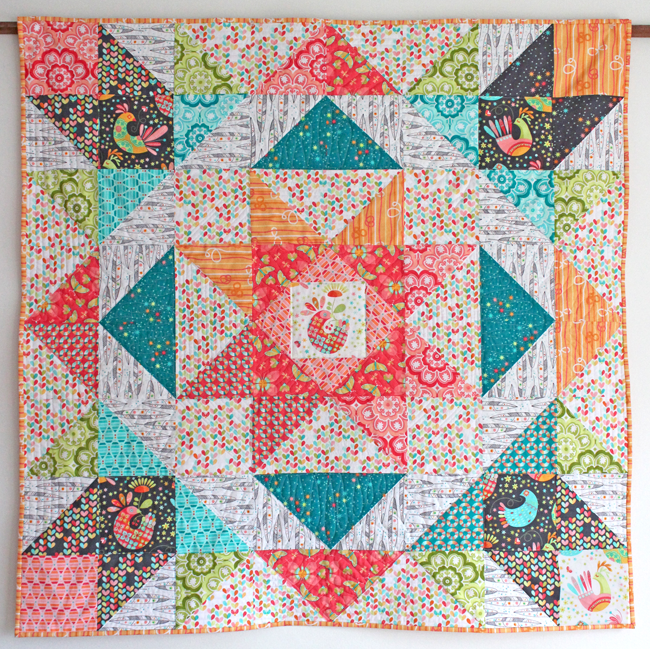 I would be making a quilt with the Bluejay collection...both are beautiful! Love the purple stack! I need a new lap quilt for the winter, and it's time for a little sewing for me. Oh, I love the rich colors in BlueJay. I'd definitely do a quilt with these! Lovely! :) I'd pick ladybug. It would be perfect for summer quilts for my little daughters. I love both colorways but would go for Bluejay, such vibrant colors! My friend has just become a grandmother for the first time, 2 baby girls in 3 weeks so quilts have to be made and this bundle would be perfect! Oh I'd love either one. So pretty. I see a great quilt out of Birs and Bees for my niece. I love the most the Bluejay colorway. It's perfect for summer skirts for my little sweetie and a new pillows for our livingroom (the butterflies are my fave print!). Winning either of these would be a dream! But I do have a long time love affair with turquoise! So the Lady Bug range really, really appeals to me! I love ladybug, so bright and fresh! Would make some lovely things for my girls. It has to be the bluejay bundle...my favorite color purple. 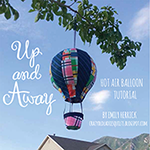 I have many patterns waiting to be made and this will help start them. I love the Ladybug fabric. I would make a throw quilt with it. Beautiful, and so fun to learn about the creative process. I like both, but Ladybug would be my choice. Think it would be used for a quilt. I love the Bluejay collection! I would use it to make my sister some rompers and a quilt for her daughter. I have cherished being able to make things for my sorority sisters and watch their families grow up! i love the ladybug version of this collection. gorgeous prints and colors. I have to go with blue jay. We are moving into a new home and this would make some great pillows or quilt for the new house. We have to choose?!?! Let's say the Ladybug. Summer clothes for my girl and a mini quilt with the leftover. This collection is beautiful! I am a huge fan of purple and would love to make myself a quilt in the Bluejay. I rarely sew for myself but these fabrics are definitely keepers! Thanks!! I love both, but the Ladybug is my favorite! I need to make a quilt for my 11-year-old daughter, and this would be perfect! Love both of the sets but the colors in Ladybug work more for the boy quilts I am making right now. I would make a lap quilt out of the fabrics. I choose Ladybug as my favorite. 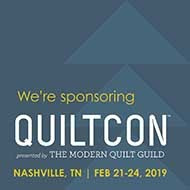 I want to make a Flight Medallion Quilt for my sunroom wall. Both are beautiful, but I love the Blue Jay and I would make totes for all of my nieces with it. Thanks! The Bluejay as purple is my, and my sister-in-laws, favourite colour! 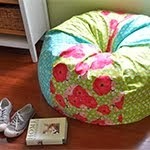 Would love to make the heart pattern into some cushions for her new home! Love your design process! Totally Blue Jay, have been dreaming of a purple and white quilt for myself! I'm picturing a Greek cross block set in white to really showcase the fabric. 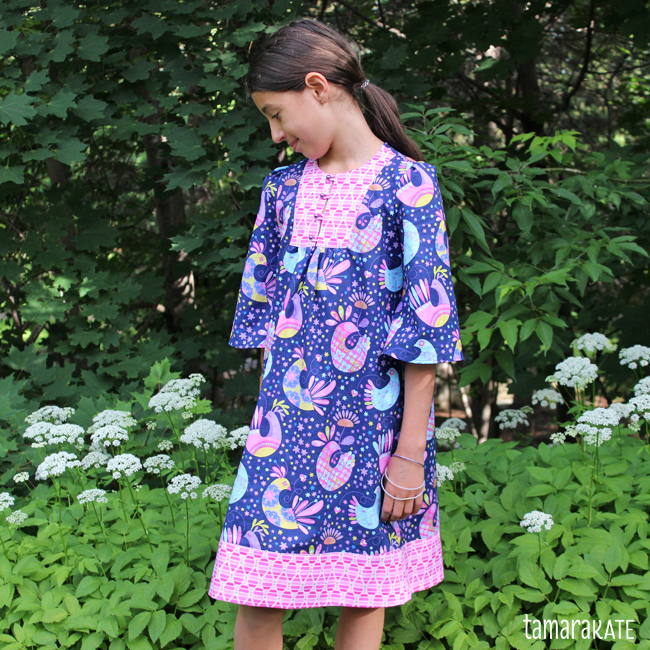 Love the opp and free patterns! Thanks and congrats on the new lines! 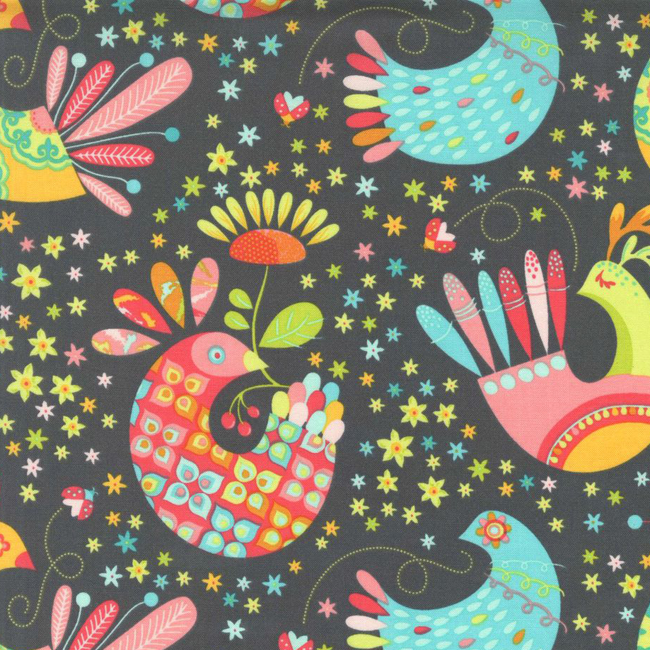 I would love to make a quilt for my daughter from the Blue Jay fabric! Thank you for the wonderful giveaway. Love both colourways. Great designs but think I would go with Bluejay. What would I make - oh so much. Little dresses, skirts, maybe a quilt. Have to think about that. 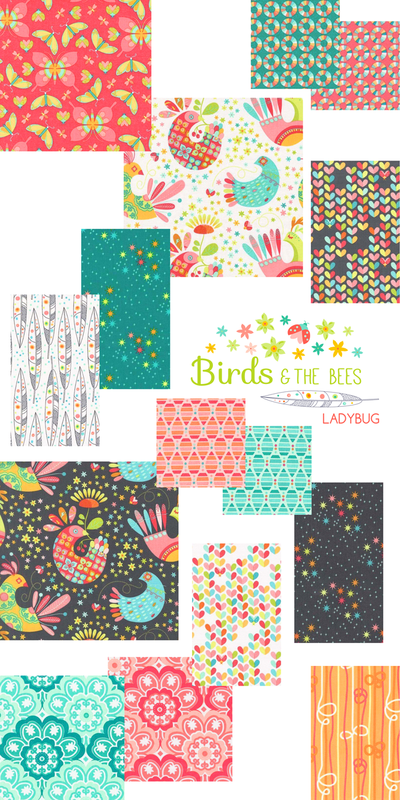 Hi, I love the colors and patterns in the birds and bees and ladybugs. I think it's about time I made myself a quilt! I like the Bluejay with all the purples. I would make a quilt for my little girl. She is 16 months and seems to favor purple. I would pick Bluejay (though it was so tough to choose!) to make a quilt! It's such a gorgeous colorway and the print is so playful. It would be fantastic to spread it out on the ground for some stargazing! I like bluejay. The dark and light fabrics would make a beautiful quilt. I love them both! But if I have to choose Blue Jay! (Trying again). I love this fabric line. I would choose the Ladybug collection and make a fun children's quilt. Both are lovely but I'm drawn to Ladybug a little more. I would either make a quilt or some cute tote and makeup bags. I would make children's clothing with the ladybug package! I love love love this fabric! Both are beautiful but the Blue Jay just sings to me. I have been wanting to start a simple HST quilt this would make that so much fun! Barbara Corry. I love the Blue Jay and a quilt would be beautiful in this! I love the Blue Jay,blue and purple are my great grand girls favorite colors. 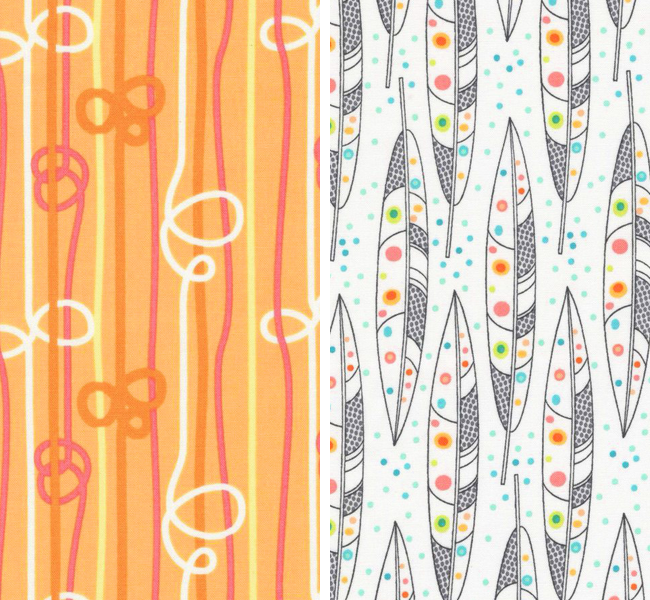 I would use these fabrics to make a quilt for the little girl being born in Oct. Both are gorgeous. I would choose the ladybug. I would use the fabrics to make a quillow. I love it that Michael Miller fabrics give quilts free patterns. Thank you for the giveaway. Both are beautiful and I will be looking for them at my LQS..however my choice would be Ladybug. Both are gorgeous! I've got to choose Blue Jay. Love those purples. 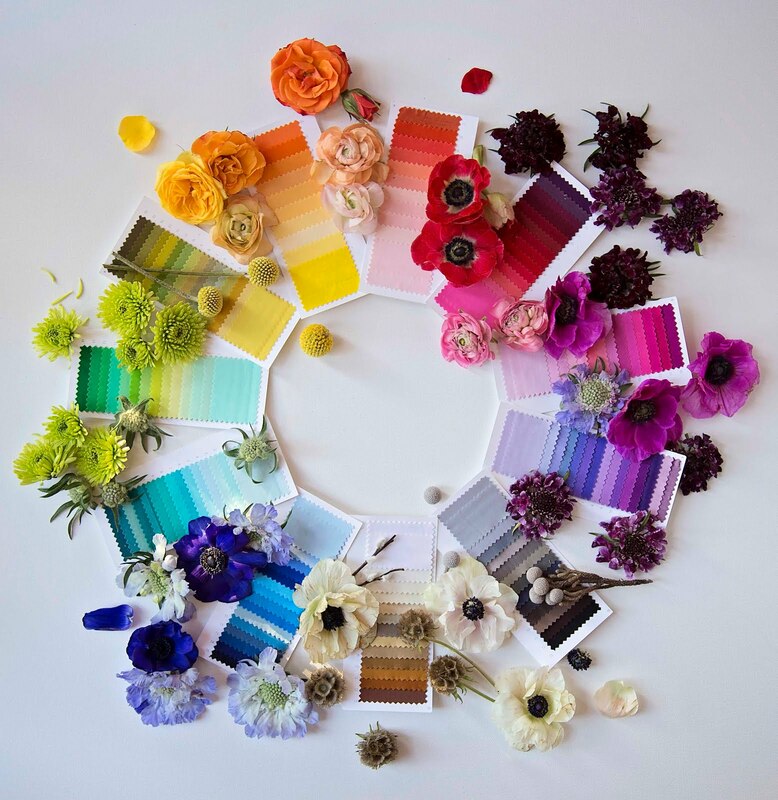 Very nice to read the thought process behind designing your fabric line. Both bundles are gorgeous. But if I'd have to choose it would be ladybug, no wait blue jay, mmmm ladybug, oh dear blue jay. Surprise me! Either one would end up cut up and sewn back together in a quilt. I love the blue jay! I would use them in a bright and colourful quilt. Either would be good but the purples are calling my name. BlueJay .. would make a bargello quilt! I love the Blue Jay! I would make my daughter a lap quilt. I LOVE the ladybug colors (especially the love bug) so much! I could use in lot of different projects as having so many ideas just looking at the fabrics. If I would have a little girl (unfortunately do not have kids yet) would like the bluejay to make little things with the popping colors. Wow! Thank you for the chance! I love the lady bug collection. I'd probAbly make little baby dresses. Got to be BlueJay...how about a quilt for ME! What a concept. I love both but I think I would like Ladybug! I would probably make a dress for one of my girls. I would love to win the Blue Jay one! I think that they would make gorgeous bags and totes! I love the Blue Jay, I'd love to make a wall hanging with those gorgeous fabrics! Such a difficult choice! Being the purple person I am, I'll have to go with Bluejay, but I LOVE the entire line!! 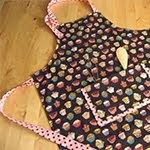 I would sew dresses, purses, hats and colourful bags. I love both collections, however the ladybug one inspires me more for summer sewing projects. I love the Ladybug colors and the flight quilt pattern! Thanks for the chance! Ladybug! My daughter would love to throw from These! love them both but especially the aqua and salmon!!! They are both gorgeous but I lean a bit more to Birds and Bees bundle. I would loose my mind if I won either one of them !! Then I would quickly gather my wits about me and go buy the other bundle and sew up the Flight Formation quilt - it's captured my heart ! It's a really difficult decision--both colorways are great! Bit I thhink I would choose Ladybug for its bright, fiesta colors. 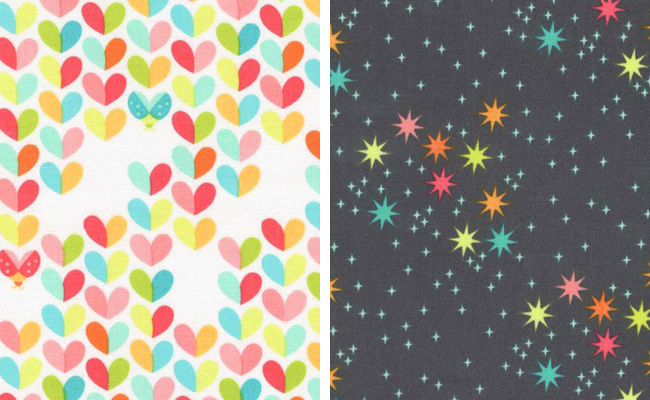 These are both wonderful fabric collections but I would choose the Bluejay for my 10 year old daughter to sew something fun this summer. I love the bluejay group, and I'd love to make a lap quilt. Both are lovely, but Bluejay is calling my name! The dress is lovely and the quilts are beautiful. I would choose Blue Jay because I love the blueberry shade, and I would hope to make a quilt. I love them both but I would pick the Ladybug and make a bag or a mini quilt. I would have to buy the Bluejay. Both are lovely. I guess if I had to pick one if choose bluejay. 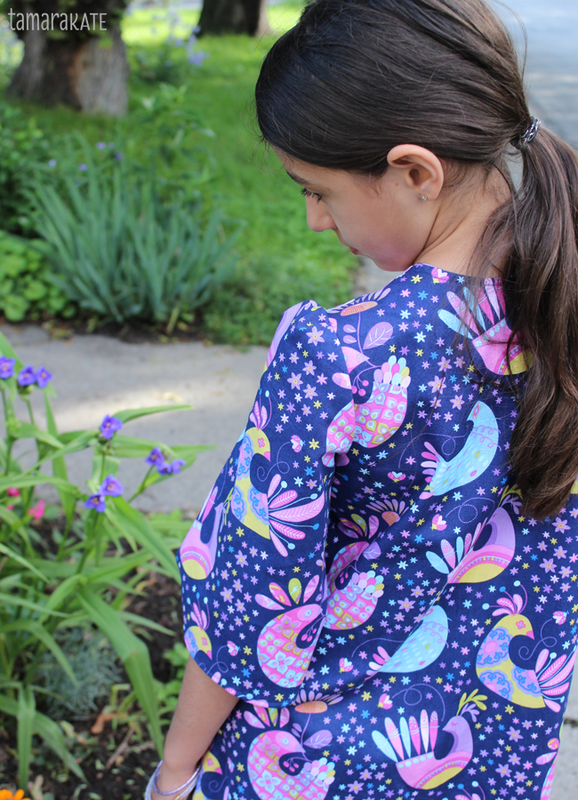 I'd make a kimono for my little girl. I like Ladybug best. I would make Beads of Courage bags for children going through cancer treatments. I love them both, but I would pick blue Jay to make some summer outfits for my girls. All these fabrics are beautiful! If I were lucky enough to be your giveaway winner, I'd prefer the Bluejay color way. The bundle would definitely be use in a baby quilt. I love them both! I'm using a lot of blue and purple these days so would (only slightly) lean toward the Bluejay colorway but would also have a great time sewing up the Ladybug! Love the Blue jay collection. My fav combo is deep purple with parrot green which looks fabulous in Silk sarees from India. I would make beautiful clutch, bags and some sofa pillows with Blue jay collection. Hard to choose between these 2 great lines--but Ladybug just says summer to me! I think I'd start by making a few small things--a tote bag, a laptop sleeve, and some mini quilts! Thanks for the giveaway! I love them both! But I like the BlueJay collection a bit more.. I'd have to make a quilt.. for me.. Both colorways are so beautiful. I think I'd choose the Blue Jay! I love the ladybug collection! I like the Bluejay colors the best. I would use it in a quilt, probably for myself! Blue Jay. A baby quilt. Hard to choose - maybe Bluejay?? 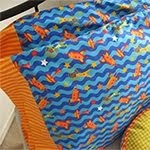 I love these fabrics, they would make awesome pillows or quilts for charities. I am all about Ladybugs, but the Bluejay colorway has Purple. So, if I were to win, it would be the Bluejay collection. Hopefully, I will see this collection in person at a quilt show or shop. I love both bundles but the deep rich colors of the Bluejay bundle just speaks to me! 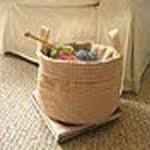 I see some purses/bags as well as a couple of sun-suits and bonnets for my granddaughters! I would love the ladybug collection! I am starting 'Christmas in July' and already working on holiday gifts! I would use the fabric in my map quilt! I love the ladybug! I would make a map quilt with it! I would go with Blue Jay. 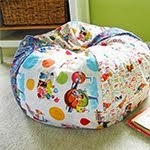 I am in desperate need of some project bags in larger sizes so that is wjat I would make. And some doll quilts and clothes. This is stunning, I loved Origami Oasis and this is awesome too! I'd choose a bundle of Bluejay if I was so lucky to win. They are both so gorgeous!! Ladybug is definitely a colour scheme I am always drawn to. 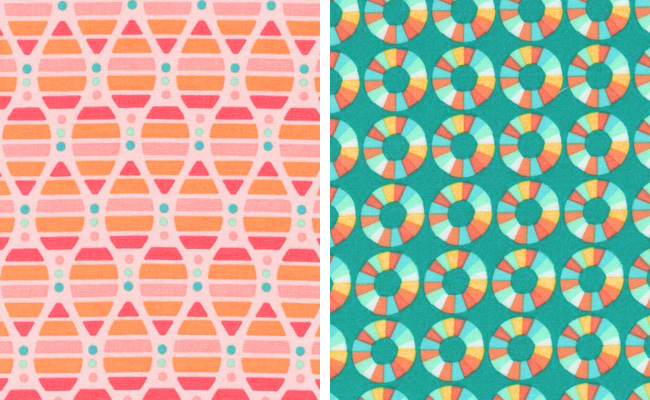 Would love to make a fun, light, summery quilt out of this beautiful line! Just love the Bluejay bundle. Would make a lovely quilt! I love the ladybug set! So great! I think I would try and make that postage stamp quilt! Such great coloring!!!! I'm loving the ladybugs Collection. I'm looking forward to making clothes for my granddaughter and a quilt. Your fabrics are delicious! Wow! What a great post. You REALLY explained your thought process, better than I've seen some others who seem to struggle to find the words or capture the creative process. Thank you for that. 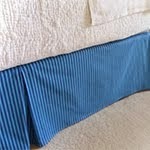 I love the Bluejay fabrics the best. Both are so fun. But my sister is always asking for a quilt in purples - this looks like it could be just the inspiration I need. I would chose bluejay and make a quilt for my purple loving daughter! Thanks for the insight into your creative process!! I love the bluejay. It would make a beautiful bag. Bluejay for sure! 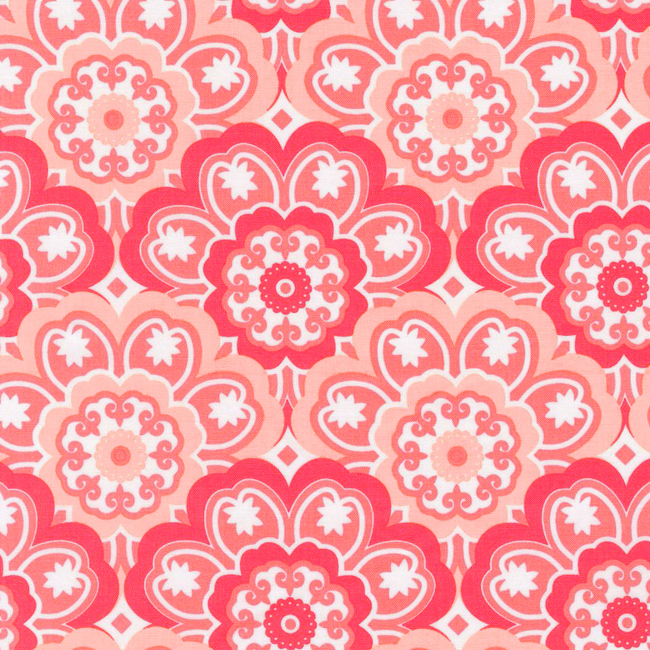 I was just looking at this fabric for a quilt from Georgetown On My Mind by Jen Kingwell. Couldn't believe it when I saw this giveaway. Beautiful colors in both bundles. A quilt. I would make a quilt from the Ladybug color way. The fabrics are gorgeous! A quilt. I would make a quilt with the Ladybug color way. Gorgeous! Bluejay! I love the darker rich colors . I'd make tons and tons of girls tiered boho style Maxi skirts! 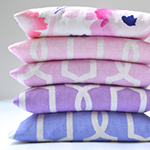 Wow, these are such gorgeous fabrics! My top choice is the Ladybug colorway, but honestly, both are just wonderful. I would love to use these fabrics to make quilts and bags. definitely blue jay for a gorgeous quilt. 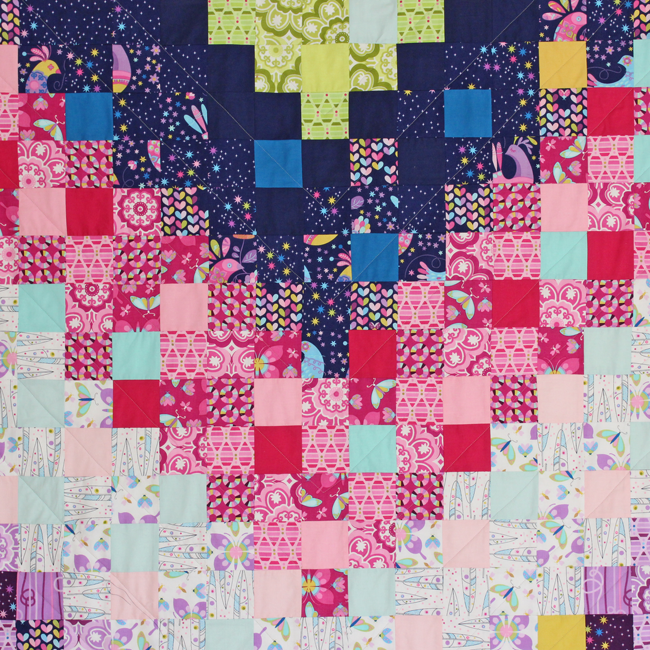 I would love to win either bundle, but would really love to make a dollhouse quilt out of the Bluejay bundle! I LOVE the Bluejay . . . I think I would use some for a Spicy Spiral table runner or maybe a kaleidoscope quilt or maybe stained glass butterfly blocks . . . hmmm - tons of ideas . . . I'm really loving the purple collection, but its a hard choice to make. I love both designs, but i think i would pick the BlueJay bundle. I would love to make my daughters a quilt. I love the Lady Bug bundle... but really they're both so beautiful. 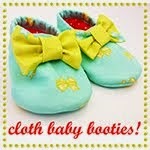 I have a dear friend with a newborn, and I would like to sew her some lovely baby things for her little girl. I have five grandsons, and only one granddaughter. She's about to turn two and LOVES purple. 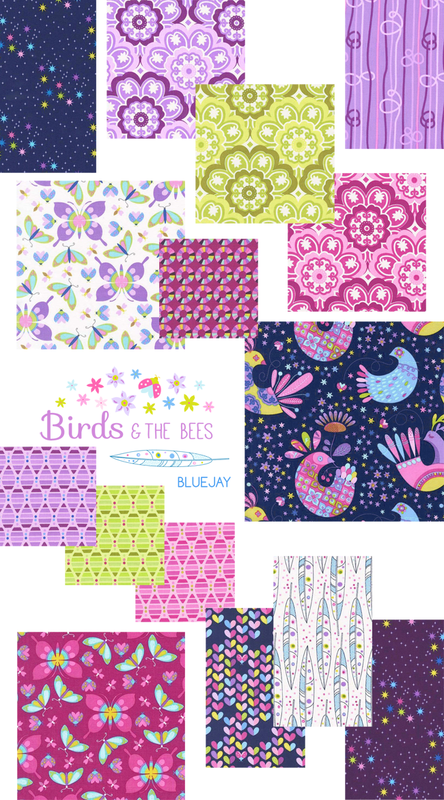 I would choose the Bluejay color set and make Lily a very girly Swoon block quilt from it. Ladybug, ladybug! I would love to make a baby quilt out of this fat quarter bundle. 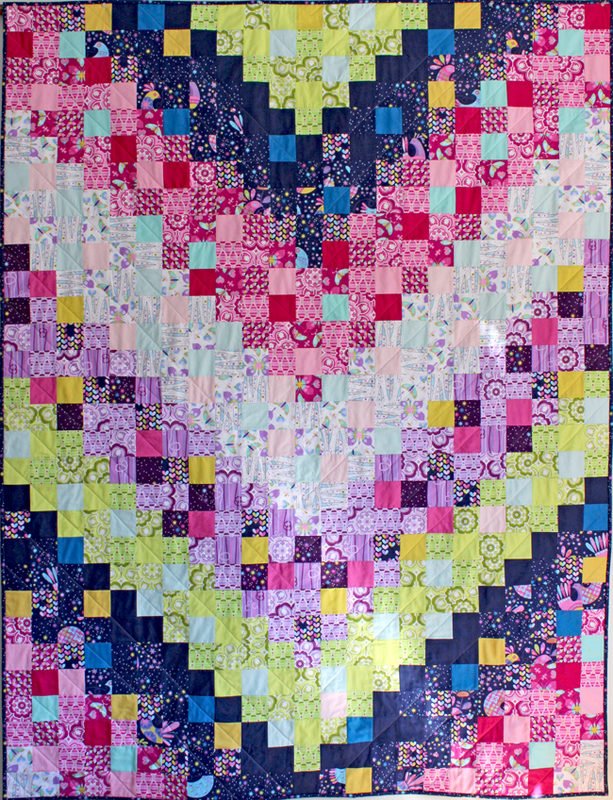 I would love to win the one with pinks and blues to make a quilt for my great granddaughter. They are both beautiful. I guess I'd choose blue jay since I'm always low on those colors. I'd love to make quilt with them for my girl. Love the bluejay. Both are amazing though. Absolutely gorgeous fabrics! Love you designs and inspiration Tamara Kate!!! Working on making my staircase as inspiring as the one you shared! :) Thanks for the chance at this awesome giveaway! I love the soft Ladybug hues - I'd make thread baskets for my new mini sewing school, and use the rest with my students to make lovely projects! I would pick the Bluejay group as purple is my sister's favorite color and I would make her a lap quilt so when she gets cold she can wrap herself up in it and feel me giving her hugs!